A taskforce created by President Obama in the wake of superstorm Sandy has issued a report with 69 policy initiatives centered around one major recommendation: to construct stronger buildings in anticipation of more extreme storms. The report, published on Monday by the Hurricane Sandy Rebuilding Task Force, had 69 policy recommendations — some already adopted — to promote resilient construction in the face of existing risk and future events, such as rising sea levels, extreme heat and intense storms. 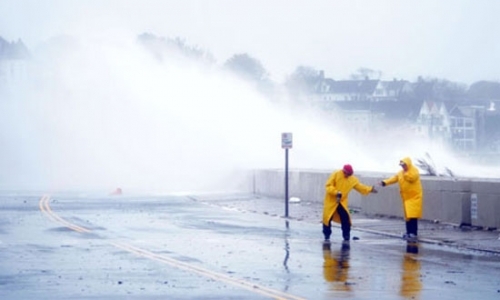 Hurricane Sandy in Winthrop, Mass. Donovan said the strategy would serve as a model for communities across the U.S. facing such risks. The report calls for more streamlined assistance for such communities, and explores how to advance energy infrastructure, to ward off outages and fuel shortages and better telecommunications in areas likely to be crippled by power failures. In the past year alone, there have been 11 separate weather- and climate-related disasters across the U.S., with estimated losses at $1 billion each, Donovan said. Sandy was the second costliest hurricane in U.S. history, after Katrina, which in 2005 caused $108 billion in damage, or $128 billion adjusted to 2012 dollars, according to the National Hurricane Center report earlier this year. The strategy focuses on what to do after a storm has already hit. It advises better co-ordination of state, federal and regional efforts at rebuilding affected areas, cutting through red tape to get maximum assistance to those affected, and aligning federal funding with local rebuilding visions. “Decision makers at all levels must recognize that climate change and the resulting increase in risks from extreme weather have eliminated the option of simply building back to outdated standards and expecting better outcomes after the next extreme event,” it said. Hurricane Sandy damage in Little Ferry, N.J.
Several of the policies and principles outlined in the strategy were already part of President Obama's Climate Action Plan, which laid out a series of common sense steps to prepare communities for the impacts of a changing climate, including the need for the federal government to make investments based on the most recent information about future risks. 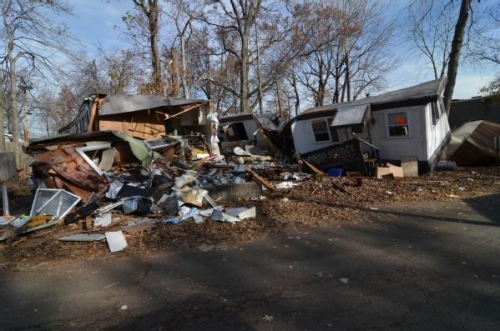 Sandy, which affected 24 states across the midwestern and mid-Atlantic U.S., killed 159 people and damaged 650,000 homes, causing an estimated $65 billion worth of damage. Much of the destruction occurred in the densely populated coastal areas of New Jersey and metropolitan New York. Obama said some of the report's 69 policy recommendations had been adopted, particularly cleaning up the New Jersey and New York shore. For instance, 97 percent of the state beaches from New Jersey to Connecticut were open by Memorial Day 2013, after the storm on October 29, 2012. Other recommendations being implemented include the creation of new flood-protection standards for major infrastructure projects built with federal money and the promotion of a tool to model sea level rises to help builders and engineers predict where flooding might be an issue in the future. The task force did not proscribe additional infrastructure needed to protect the shoreline. It endorsed a greater use of natural barriers like wetlands and sand dunes, but said that better tools were needed to analyse what worked and the costs involved. It also endorsed an ongoing architectural competition called “Rebuild by Design”, in which teams of engineers are exploring ways to address vulnerabilities in coastal areas. Reprinted with permission by The Guardian.